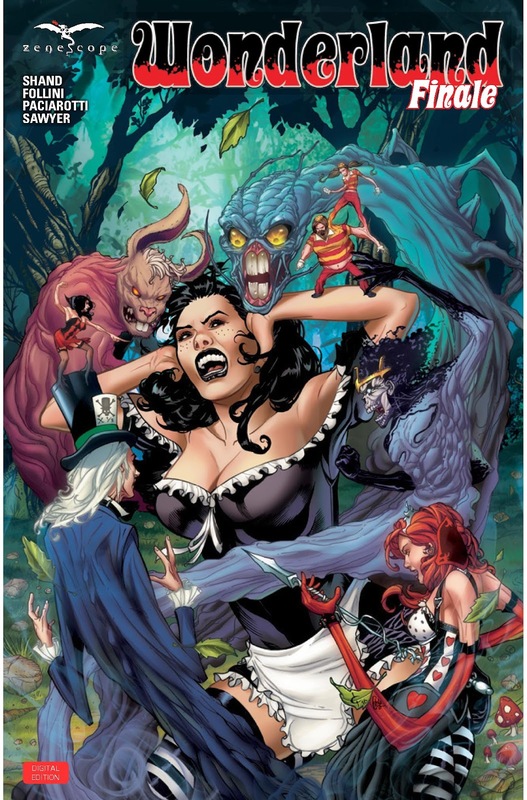 The Fellowship has obtained a first look at WONDERLAND FINALE from Zenescope Entertainment. The issue, which hits stores September 21st, is written by Pat Shand, drawn by Francesca Follini, colored by Leonardo Paciarotti, and lettered by Christy Sawyer. After years of struggle and torment Calie Liddle has finally realized she cannot save Wonderland from the madness that infests it. All she wants to do is go home and try to live a normal life with her daughter Violet, and try to put the memories of Wonderland behind her. But escaping madness is never that easy and Wonderland has no intention of letting her go that easy. Don't miss the final chapter of the story that started in the Wonderland trilogy.